I ended up getting a few VR games for our shiny new HTC Vive. Dungeon Knight VR, Karnage Chronicles, and the Croteam VR bundle. Grim Dawn is amazing fun. One of my favorite games in the genre. Monster’s Den Godfall is awesome. @garin did a fantastic job adding new gameplay elements to the already addicting MD dungeon crawling, making for a unique experience I really enjoyed. I keep meaning to jump back into it…but new games keep getting in the way. Too much backlog to worry about a February sale. I was going to pass on it, but The Witcher 3 GOTY was 15, and I had yet to pick it up. So I got that and a couple other things on my wishlist. I started on PS4, but never bought the DLC, so it isn’t 100% a re-buy. It definitely makes the whole exercise somewhat more worthwhile than it has been of late, and I say that despite taking a pass on it. An offer like this when I wasn’t up to my ears in new, lengthy games would be very hard to resist. Yeah, at least anecdotally this seems to be working very well for them. If that’s the case, I’d expect to see more of it. Works for me, certainly. I picked up one piece of DLC for Tyranny, as I plan a replay soon. In general, though, I’m trying to stop buying stuff on sale. I’ve done that with most things (clothes, food, etc), and I need to extend that to games. I’m going to buy stuff I want to play, when I want to play it. I’ll spend more per game, but quite a lot less overall. I skipped this sale. In addition to my huge backlog, I need to dust my Oculus off and I am likely to buy a PS4 and/or Switch soon. Now if I can just stop playing Slay the Spire, I might actually play some of them! Appreciate it! Hope you enjoy the game, @Gigglemoo! What makes this one so good? I’ve had that on my wishlist for a while. Quests/Missions including story missions that enhance the Godfall setting. A world map that includes overland travel, exploration, ruins, hidden POIs and multiple cities and towns. A management aspect where you run a mercenary company, allowing for multiple characters and teams of characters, upgrading your keep, unlocking and implementing doctrines for bonuses, etc. Overall, the game is a simple dungeon crawler at heart. Assemble your team, take on some level 1 missions, go clear a couple of randomized dungeons, gain experience and loot, level up and improve your weapons and armor, lather, rinse, repeat. It’s repetitive in the same way that all games in the genre are repetitive, but what sets Godfall apart are the layers of both overland exploration and team management that give you something to do other than just clear more dungeons. 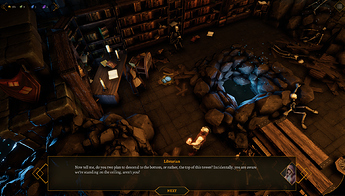 The game is easy to learn, has that addictive “just a couple more rooms to clear this dungeon!” gameplay, and can be picked up anytime and played in small chunks, all of which combine to make it a great little time sink for people who enjoy turn-based, multi-character dungeon crawler RPGs. I’ve never played the web games, maybe I should search one out and try one. Then again, I’ve got multiple long turn based party RPGs queued up so maybe I should revisit in the future :-) I’ll keep it on the wish list so I don’t forget about it. You can play Monster’s Den Chronicles free on Kongregate still I believe. That gives you the basic idea of how the party-based combat and exploration work. 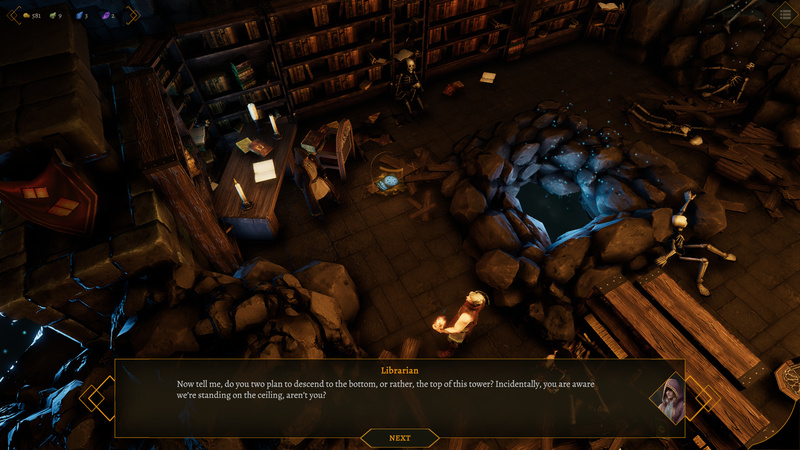 Godfall just takes that framework and builds on it a ton, improving and expanding it greatly. Just don’t think about how the tower is upside down, but all the floors are right side up. This has been bugging me ever since I saw the comment. I finally put some time into the game today, and the whole time this statement irked me because I couldn’t figure out why the developers would come up with such a weird concept (a tower driven straight into the earth like a stake, while upside down) but then have such a glaring oversight. But thanks to one small piece of dialogue between my party and some dude, I can finally play without the idea that “the tower is upside down while the floors are right-side up” constantly nagging at me. What does that mean though?? It means that the tower is upside down, and you’re walking on the ceiling, *relative to the rest of the planet. But because the tower is upside down, the ceiling is a floor, and you’re walking on the floor, because of spooky magic. To an outside observer you’d be upside down like the tower.